A Flash, or flashgun, is a device used in still photography to brightly illuminate a scene just for the moment of exposure. In the mid-19th century burning magnesium was used as a means to shorten exposure times by throwing a very bright light onto a photographed scene. When the relative fast dry film plates became common in the 1880s this method continued, and firms like Kodak sold flashlamps which ignited a mixture of magnesium powder and potassium chlorate with a gas flame, a spirit flame or an electric wire. Such a flash exposure must have been an exciting event, almost like small fireworks. 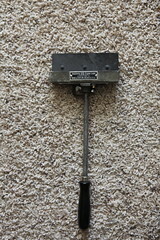 Agfa offered a combination of a tray for the flash powder with a gas lighter pistol, and another more reliable flashlamp which was ignited by percussion caps. Constructions like these may be the origin for the still-used term "flashgun". The handling of the flash powder was dangerous. In 1927 General Electric introduced electric flash bulbs. 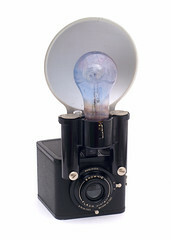 By 1930 other companies joined the flash bulb industry, for example Philips with its Photoflux lamps. The bulbs gave light by burning a mesh of thinnest crumpled aluminium wires and foils in an instant, ignited by the power of a simple battery. The bulbs could be used only once, and at first they were too expensive for most amateurs. 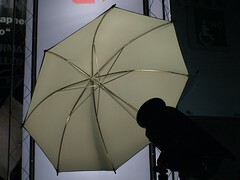 But professional press cameras with big reflector around the top of the attached flash bulb holder became a common sight. Flash powder might still be used for specialist uses, however, including night-time aerial photography. During WWII electronic flashes giving light from electronic gas-discharge tubes were developed. 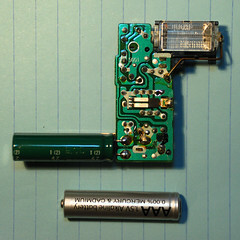 In amateur photography electronic flashguns became common in the 1960s, when electronic switches, compact transistors, and thyristors made these devices small and affordable. 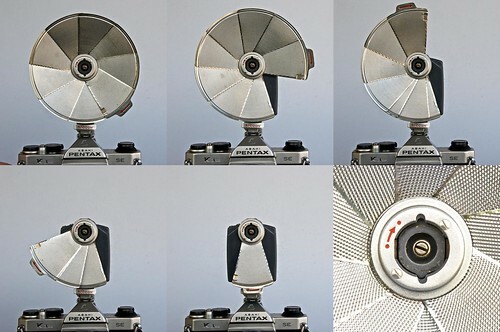 But in spite of that development, a whole generation of popular cameras still used expendable flash bulbs, particularly those for 126 and 110 film cartridges. 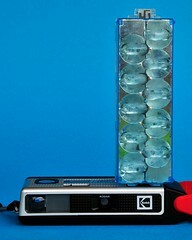 These used plastic flashcubes with four bulbs, or disposable flip-flashes with a row of bulbs in one piece. Magicubes and flip-flashes had little reflectors around each bulb, making further reflectors superfluous. 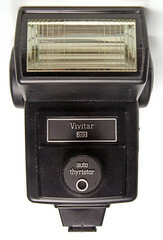 In the 1970s sales of cubes and flip-flashes were a main part in sales of expendable photographic goods. 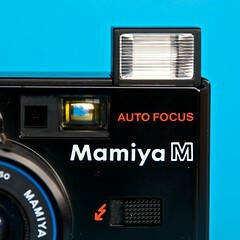 Modern cameras have built-in flash units, either near the viewfinder, or as flip-up or pop-up units. ↑ See for example, this datasheet dated 1966, on a 100-lb photoflash bomb, from Mulvaney’s Ordnance Technical Information System, at UXOinfo.com; cited in the Photoflash bomb entry at Wikipedia.